This is a great video clip which features the opening and closing titles from the programme, plus, a rundown of what's on childrens BBC on that afternoon, and the start of Hart Beat with Tony Hart. I still have lots of memories from this American adventure series for kids, which revolved around five pre-teens who lived in the inner city with their dog. 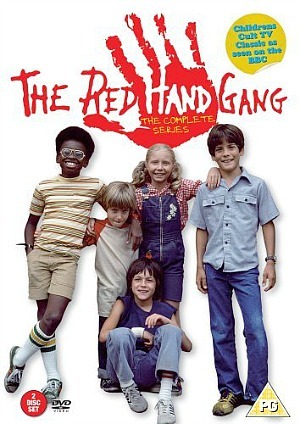 Why was it called The Red Hand Gang? The gang members used to leave a red hand print on fences to let each other know where they had been. The series ran on NBC in the U.S. for just one season during 1977, and was imported to the UK (I'm not sure about the exact period when it was aired over here, although I'm guessing about 1980) where it gained a cult following. So much so, that the series was released on DVD in 2008 only in the UK, although it was eventually released in the U.S during 2009. Frankie (Matthew Laborteaux) the gang leader, Doc (played by James Bond III), Joanne (Jolie Newman), Lil' Bill (Johnny Brogna) was Frankie's younger brother, J.R. (J.R. Miller) and Boomer the dog who had his own series in 1980 called Here's Boomer which ran for two seasons. Where are the Red Hand Gang actors now? 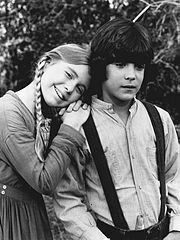 Matthew Laborteaux went on to play the character of Albert Quinn Ingalls in Little House On The Prairie between 1978 and 1983, and also starred in the Red Hand Gang spin-off Here's Boomer in the early 80s. He has appeared in numerous other TV shows and since 1994 had provided voice overs for computer games, animations and TV adverts. James Bond III played the role of Monroe in the 1988 movie School Daze, and also had a role in the TV series American Playhouse in 1985. He is a producer and director and is the founder and CEO of Solid Rock Pictures and the Underground Railroad Company. Jolie Newman sadly died aged just 36 on March 31st 2002. She was a successful producer. Johnny Brogna. Some sources suggest that he sadly died on February 16th 2009 aged just 40 and we mistakingly published this incorrect information - huge apologies for this! Thank you to Anne Fitzgerald Rogers for pointing out that he is still very much alive - see the comments box below. Johnny provided a voice over in the 1981 animated movie American Pop. He was a teacher at Everett High School in Florida for 10 years. J.R. Miller continued working as an actor and has had parts in Starsky and Hutch, the TV series Archie Bunker's Place, the sitcom The Bon Newhart Show and also in the film The Amityville Horror. I have been unable to find out what he is up to right now. The 1990 horror film Def By Tempation was directed, produced and penned by James Bond III. He also starred in the movies.